Cover: Working left to right, it’s not entirely clear whether there are four or five of The Chosen on the left hand side. Far left might be Xiang Po but the footwear looks identical to that of Takeo Yakata who’s next; guessing Janwillem Kroef is next; then Salima Baranizar; then possibly Nikolai Latikov; then Herupa Hando Hu; Nadia Safir; Betty Clawman; Celia Windward; Gregorio de la Vega; and Tom Kalmaku. Page 1: Lana Lang surprises Clark (Superman) Kent in the offices of the Daily Planet and utters the Manhunters’ catchphrase. Page 2 – Panel 3: Superman mentions the JLI ship blowing up and the Manhunters getting at Firestorm; all that and more happened in Week 1’s Crossover issues. Page 2 – Panel 5: Lana makes it clear that she’s working with the Manhunters and doesn’t expect Superman to join them. Page 3 – Panel 1: Superman tries to appeal to Lana using their shared history. Page 3 – Panels 4 and 5: But that doesn’t work and Lana rips open his shirt, planning to reveal his identity. This scene is resolved in SUPERMAN #13 which you can find in Week 2’s Crossover issues. Page 4 – Panel 1: Herupa Hando Hu and Nadia Safir flying across the Pacific Ocean. Page 4 – Panel 6: Betty’s happy to join. Page 4 – Panel 2: Herupa mentions Terra being dead, as they discovered in the previous issue, but also that “Raoul [is] senile” which is the first mention of someone called Raoul. Page 4 – Panel 3: Ayers Rock or, as it’s now better known, Uluru in central Australia. In the DCU, everything mystical in Britain must take place at Stonehenge; in a similar way, everything mystical in Australia happens at Uluru. 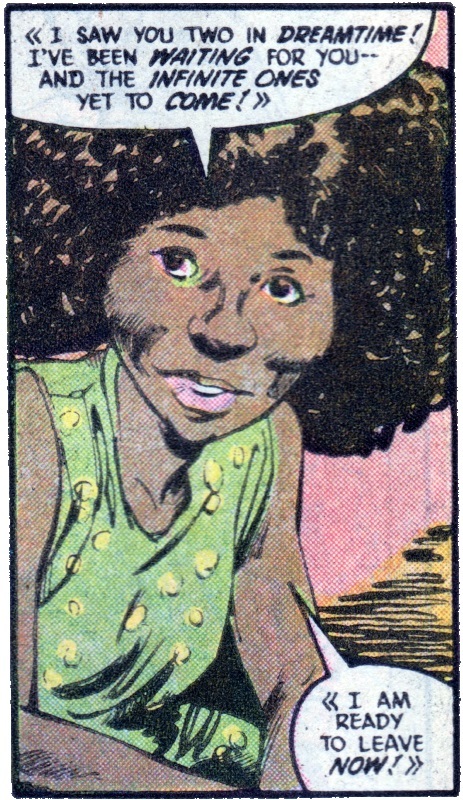 Page 4 – Panel 4: And here’s the first of The Chosen, Betty Clawman. Page 4 – Panel 5: Betty is more than happy to join them. The “Infinite Ones” she mentions will be revealed in the next issue. Page 5 – Panel 1: Despite her enthusiasm, Herupa tells Betty to wait until the “Infinite Ones” arrive. Page 5 – Panel 4: Herupa reveals himself to be a condescending jerk. They also meet Takeo Yakata, the second of The Chosen. Page 5 – Panel 5: But despite giving him the same line as they gave Betty, Takeo is less impressed. Page 6 – Panels 2 and 3: However, a quick demonstration of teleportation later, and Takeo’s signed up. Page 6 – Panel 4: We’re off to Gotham City where a familiar silhouette stands in an office. Page 6 – Panel 5: Seated is Commissioner Gordon while Batman brings him up to date with what’s been going on. The events of Superman #13 presumably take place before this conversation. Page 6 – Panel 6: Somehow, Batman’s heard that the Manhunters have a document that contains the secrets of the heroes which is how they’re able to infiltrate them. This is the first we’ve heard of this document. Page 7 – Panel 1: Gordon offers up the name of Harbinger in connection with this document. Page 7 – Panel 2: Batman knows Harbinger from the Crisis on Infinite Earths and can’t believe she would betray the heroes. Page 7 – Panels 4 to 6: As Batman ruminates on how he and most of the heroes would not succumb to blackmail from the Manhunters, Gordon comes up behind him and pistol whips him. 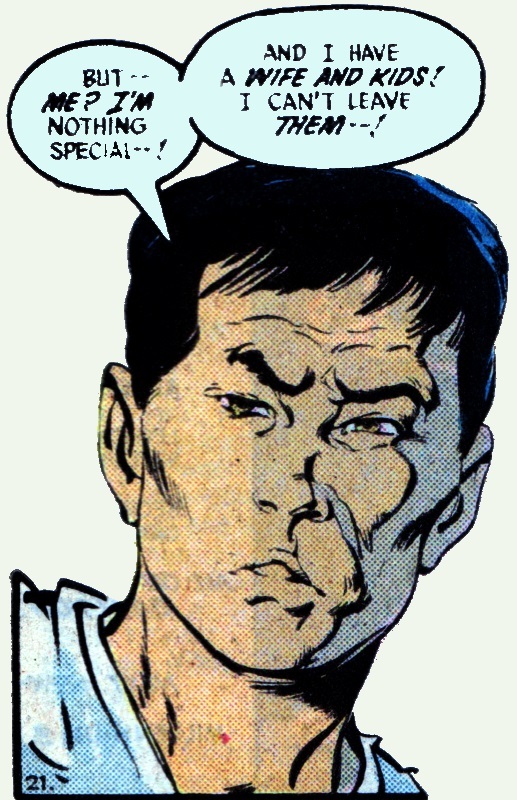 Page 8 – Panel 1: With a “We know!” Gordon reveals himself to be a Manhunter agent. Page 8 – Panel 2: Back with Herupa and Nadia who are now in China. They are surprised by the arrival of . . . Page 8 – Panel 4: . . . Harbinger. Page 9 – Panel 1: As Herupa says, Harbinger was the aide to the Monitor during CRISIS Nadia’s comment of “It is a pleasure for me to meet a woman like you!” seems odd; Nadia is a warrior; Harbinger isn’t. Is she just glad to meet another woman in armour? Page 9 – Panel 3: Harbinger’s ability to split into different selves was seen during CRISIS. Page 9 – Panels 4 and 5: Having seen Nadia and Herupa make an offer to Takeo earlier, Harbinger offers her services to them. Page 10 – Panel 2: Herupa blames Harbinger for rise of the Manhunters . . . Page 11 – Panel 5: It is she. Page 10 – Panel 3: . . . because her HISTORY OF THE DCU orb, containing everything about the heroes, went straight to the Manhunters. This panel also has the face of the Monitor. 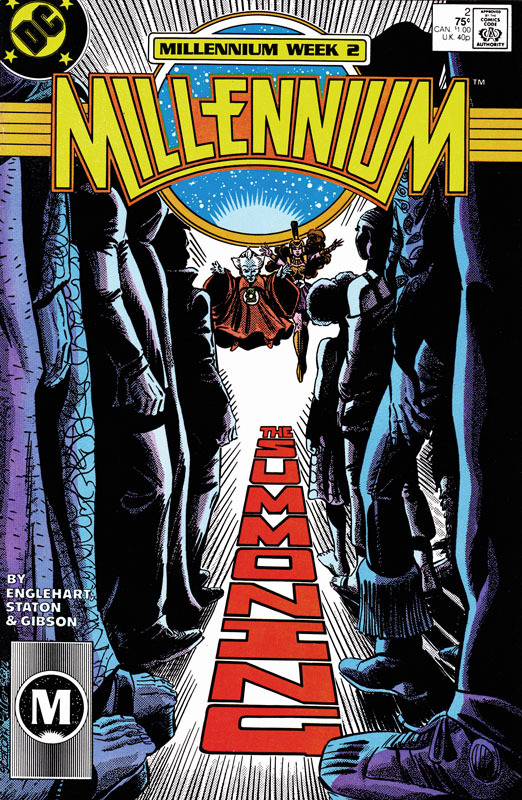 Page 10 – Panel 4: This is the first mention in the story of the Manhunters having a central world, hidden from view, which (by strange coincidence) lays in the path of Harbinger’s history orb. Page 11 – Panels 1 and 2: Consumed by guilt, Harbinger heads into space to find the Manhunters’ world. Page 11 – Panel 3: And judging by Nadia’s comment, that’s exactly what they wanted to happen. 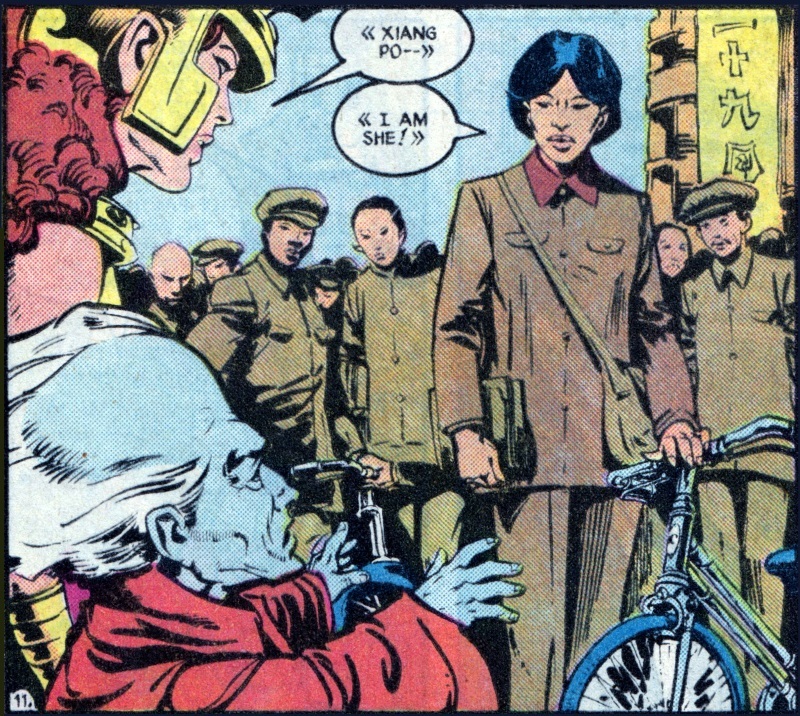 Page 11 – Panel 5: Nadia and Herupa meet Xiang Po and give her the same line that they’ve given to all of The Chosen. Page 12 – Panel 2: Xiang is cautious and needs to confer with her parents and possible the country’s leaders before agreeing. Page 12 – Panel 4: The pair head to Russia to meet the next candidate . . . Page 12 – Panel 5: . . . Nikolai Latinov. Page 13 – Panel 1: Being a good Communist (note the picture of Lenin above his desk), Nikolai immediately assumes this is some sort of test arranged by his leaders. You gotta love the internet – it took me ten minutes to find that out! Page 13 – Panel 6: In Chicago, Blue Beetle arrives in the office of Max Fisher, a Lieutenant in the Chicago Police Department. Page 14 – Panel 1: Beetle confronts Fisher, convinced the officer is a Manhunter. Page 14 – Panels 2 to 4: But despite his suspicions, Fisher claims to know nothing of the Manhunters, though he has been blackmailing Beetle in his own series. Page 15 – Panel 1: Beetle reluctantly comes to the conclusion that Fisher’s telling the truth. Page 16 – Panel 1: It’s raining in fascist Britain, but Celia isn’t wet! Page 15 – Panel 4: On the roof, waiting for Beetle, is an old villain of his, Overthrow . . . Page 15 – Panel 5: . . . who admits to being the Manhunter agent Beetle is looking for. Page 15 – Panel 6: We catch up with Herupa and Nadia who are about to meet the next member of The Chosen here in Birmingham . . . a city in “fascist Britain” . . . where daylight doesn’t appear, even at 9 in the morning. For what it’s worth, I railed against this panel on my old blog way back in 2009. 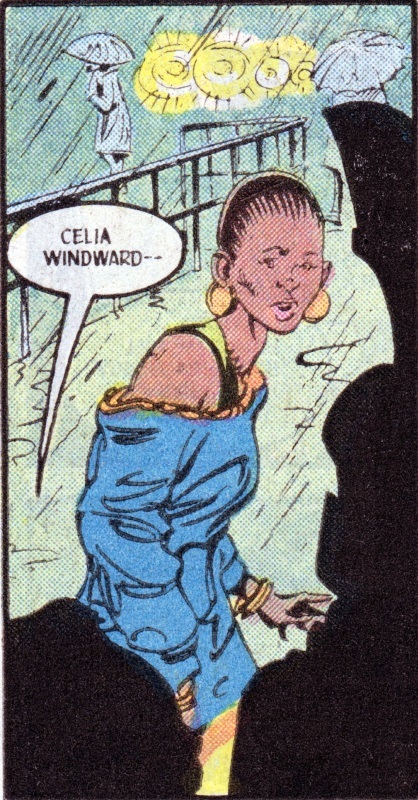 Page 16 – Panel 1: They meet Celia Windward . . . Page 16 – Panel 2: . . . and give her the usual spiel. Page 16 – Panel 3: Celia clearly has a negative view of the world, for which she blames America. Page 16 – Panel 4: And that’s enough for Nadia and Herupa who, as quickly as they’ve arrived, leave once more. Page 16 – Panel 5: This time arriving in Iran to greet Salima Baranizar. These last two appearances have had the Guardian and Zamaron simply appearing in mid-air whereas they flew from one location to another in the earlier part of this issue. Page 16 – Panel 7: Blasphemy! 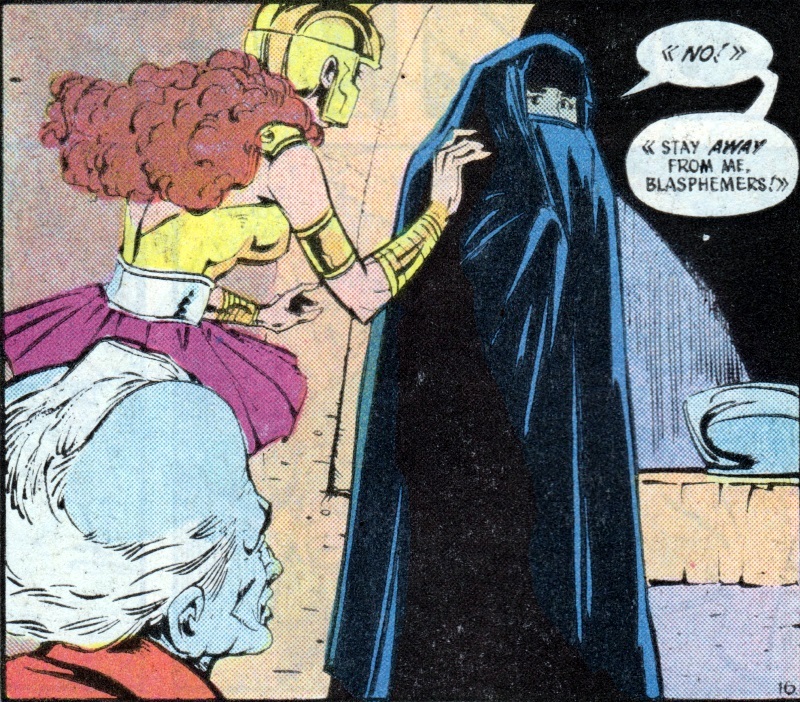 Page 16 – Panel 7: Salima, however, considers their words to be blasphemy. Page 17 – Panel 1: Unlike Celia in “fascist Britain“, Herupa and Nadia actually try and persuade Salima to join them, rather than simply disappearing. Page 17 – Panel 3: Nadia seems convinced that Salima will join them. Page 17 – Panel 4: Dan Richards, the original holder of the Manhunter name when it was used by him during his heroic exploits with the All-Star Squadron during World War II. 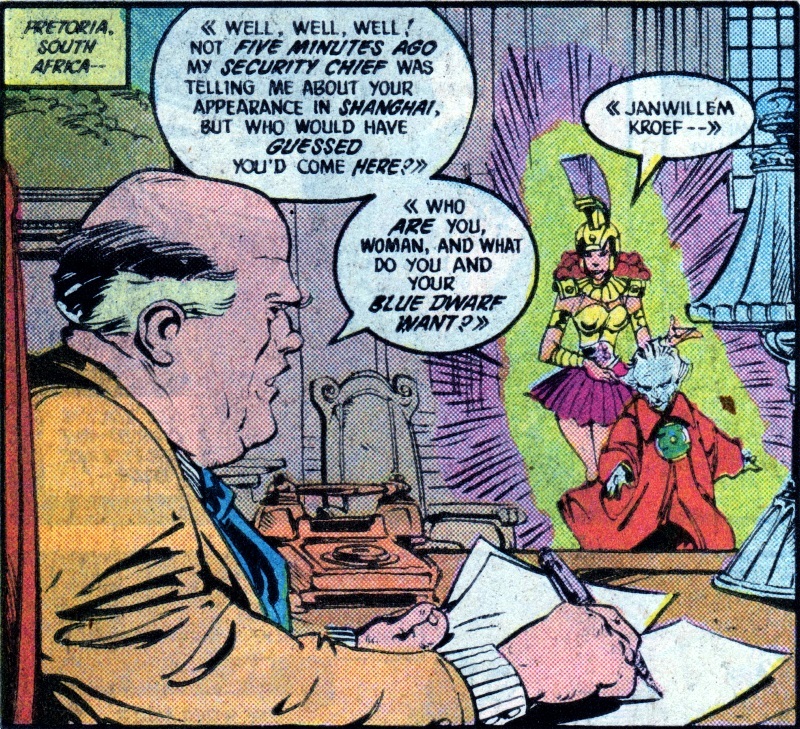 Page 17 – Panel 5: Laurel Kent who, at this time, was actually appearing in the pages of LEGION OF SUPER-HEROES as a presumed descendent of Superman’s. Her thoughts reveal that she is a Manhunter android (as opposed to being a human agent) that could survive for a thousand years . . . which is when the Legion’s adventures take place. Page 17 – Panel 7: The two Manhunters pass each other, unaware of the significance. Page 18 – Panel 1: They next appear in the office of Janwillem Kroef of South Africa. Page 18 – Panel 3: As this is 1988, apartheid is still in force in South Africa and Kroef is clearly racist with his comment of “any group of people needs the white man to run them!” I can only hope the expressions on Herupa and Nadia’s faces manage to convey the contempt they should feel for him. 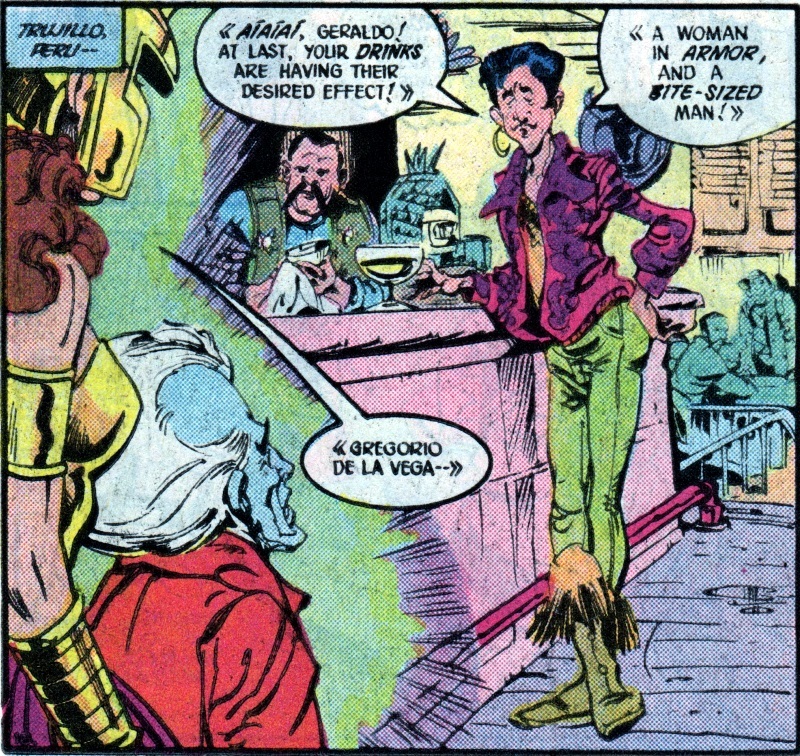 Page 18 – Panel 4: And they next appear in Peru to Gregorio de la Vega. Page 19 – Panel 1: It seems Gregorio is referring to himself as the fruit that has been picked. However, he appears uninterested in being part of The Chosen. Page 19 – Panel 3: Tom Kalmaku, last seen in the previous issue after having been badly beaten by the Manhunters, regains consciousness. Page 19 – Panel 6: Standing over him are, left to right, Kilowog, Hal Jordan, Katma Tui, John Stewart, and Arisia. Page 20 – Panel 1: Tom has been healed by Kilowog whipping up something with his power ring. Page 20 – Panel 2: And that explains how he’s ended up here. Page 20 – Panel 4: Tom fills the Lanterns in with what he’d been doing and what he’s found out about Mr Smith. Page 20 – Panel 5: Herupa and Nadia arrive at the Citadel. Page 20 – Panel 7: And Arisia fills them in about the heroes that have been attacked, and what Tom saw. Page 21 – Panel 1: To which Herupa replies with a not very sympathetic “We told you that would happen!” type of remark. Page 21 – Panel 3: Herupa says that the heroes will be a lot busier after he and Nadia “speak to the final person” that they’ve chosen. 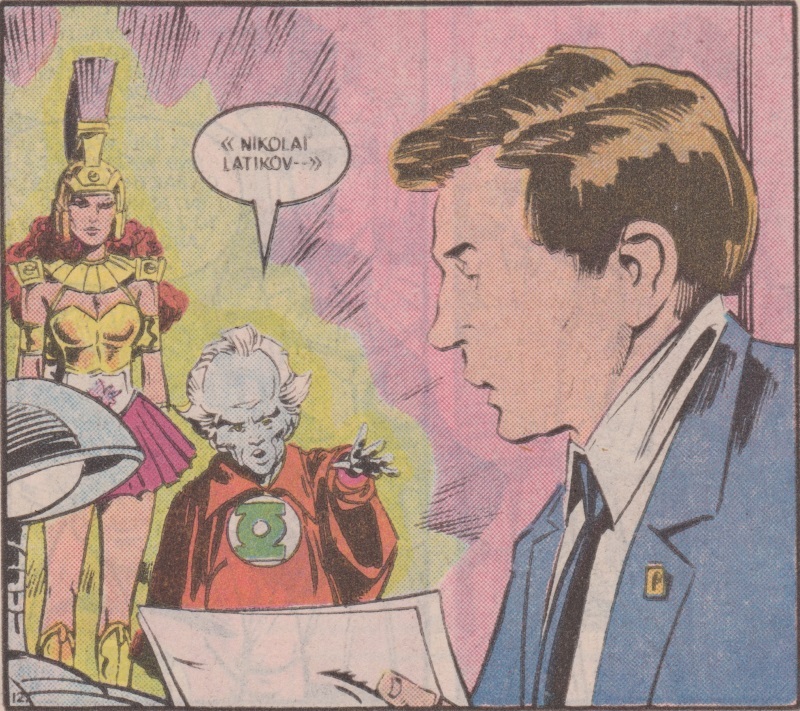 Page 21 – Panel 5: Once Nadia reveals it’s one of the people in the room, John assumes it’s a Green Lantern. But, as you can probably tell by the picture on the right, it’s . . . Page 21 – Panel 7: . . . Tom Kalmaku. Page 21 – Panel 9: Herupa says that Tom is the last of The Chosen. On Page 20, Panel 6, Nadia said they’d spoken to eight of The Chosen; Herupa has now said that Tom is the last; that’s nine. There’s even a helpful text panel (Page 21 – Panel 10) that counts up everyone and which reads “that only adds up to nine people so far!” so someone is clearly missing. Page 22 – Panel 1: Here’s a quick, last page trip to Arkham Asylum. Page 22 – Panel 2: Here’s the Joker; his hissed line about “Fissshhhhh!” is doubtless a reference to the classic The Laughing Fish story in DETECTIVE COMICS #475 which was also written by Steve Englehart. Page 22 – Panel 3: The Psycho-Pirate shouting about how he beat Infinity Inc and the Outsiders in THE OUTSIDERS SPECIAL and INFINITY INC SPECIAL crossover in 1987. As an aside, it’s interesting to see him shouting about something other than how he remembers the multiverse. Page 22 – Panel 4: And here’s the Floronic Man, talking about having had a visitation. Page 22 – Panel 5: He’s the replacement for Terra who died before the story began, so is clearly one of The Chosen. Page 22 – Panel 6: Although his goal might not be in line with the rest of them. If, by the time Herupa and Nadia approach Tom, they’ve spoken to eight of The Chosen, then Tom is the ninth, but Herupa claims he is the final one. 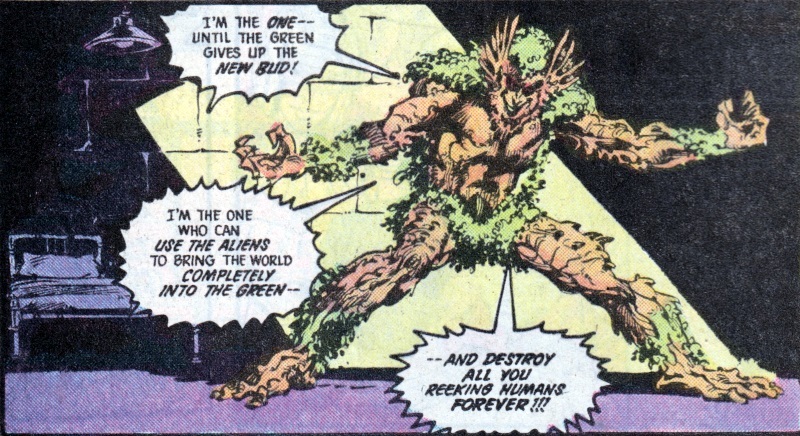 So when did they speak to the Floronic Man? Before Tom? But if so, why claim to have only spoken to eight and have Tom as the last?